+ any of your other favorite movie candy! Line a small baking sheet with a sheet of aluminum foil, then place a sheet of parchment paper over it. Melt 14 ounces of the chocolate, either in the microwave (I do this in 30 second increments, stirring afterwards until it is all melted - be careful, it can burn quickly!) or with a double boiler. Pour the chocolate on the parchment paper and use a spatula to spread it into a square or rectangle. 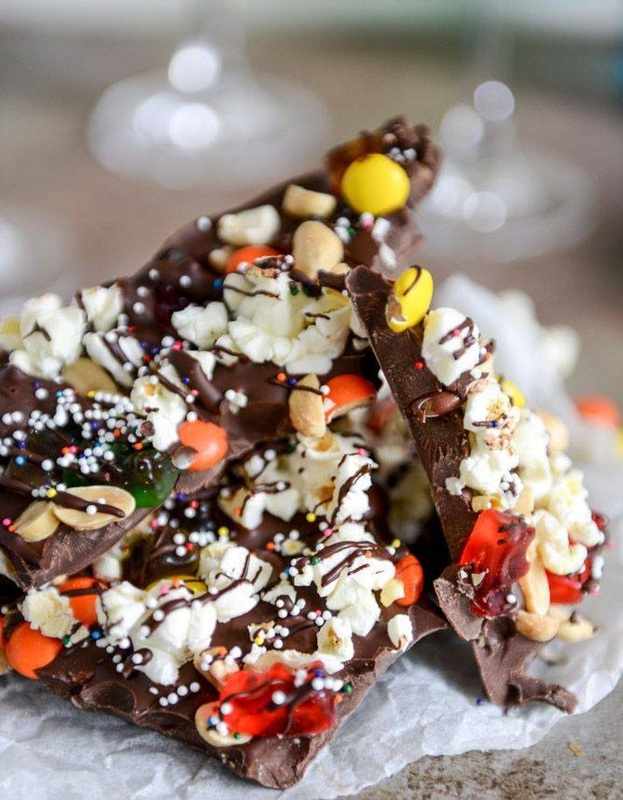 Throw some of the popcorn, candy and sprinkles on top any way you like, making sure they stick. To make the bark quickly, stick the pan in the fridge for 30 minutes. Melt the remaining 2 ounces of chocolate, remove the pan from the fridge and drizzle it over top. Add any additional candy or sprinkles you'd like, then place back in the fridge for a few minutes to set.